But in my desire to live a quiet life in the countryside with four lovely donkeys, I have found myself targeted by a minority little group of people from Finestrat in their nasty little war against “outsiders”. These are hunters, not just having a hunting mentality, but an aggressive rejection of residents of other nationalities within their midst, eventually leading to threats of violence. Finestrat has a fascinating history. As a teacher of Geography it has been a great privilege to live and work here and bring school children to the village to appreciate the history and culture of Finestrat. In the past few years I have brought school groups every year to Finestrat, from Costa Blanca College and then from Elians School. We spent time in the museum and we met with the Mayor in the council chamber. Our appreciation of the culture and history of Finestrat was always foremost, and we learned about the way the village was a “beacon of integration” between traditional Valenciano culture and modern multi-national immigration. Mayor Honorato Algado was enormously appreciative of the input of Residents of Other Nationalities, in his talks to the school children I brought to Finestrat. A good local history text is “Finestrat: Defender un territorio” which relates the history of the defence of this territory by those who lived here over millenia. How they lived their quiet and productive lives and defended their homes against the aggressor. The local history and culture is rich and glorious. It is a shame that this vision is completely let down by a small minority of people who live in Finestrat village and take an isolationist aggressive stance against “outsiders”. They are represented by the hunters: these are the men who go out of Finestrat into the country (where we live) at weekends with packs of uncontrollable dogs, firing guns in all directions – with hardly much aim and very little reward – and insulting and abusing residents who live in the country, while destroying their peace and quiet at the weekend. An example of this was recorded by me in November on my donkey field. The man who gets out of the second car is the secretary of the Finestrat hunters association. He is in court in Benidorm at midday today and I will be answering the judge’s questions as best I can in Spanish, representing myself against these bullies. The land on which they are standing is private land, by the way. They have no right to be there. I will present the outcome of the case on this blog later today. The video has been seen by 2548 people since it was first uploaded in November. (According to stats, most of those were in Finestrat.) The video will be used in court. Only the two hunters who appear in the video were in court. The third (who stays hidden in his car in the video) is the man who made the most serious threats earlier in the day at 9.30, holding up a very large rock, picked up on the edge of my donkey field. The above photo just caught him as he was putting it down in a panic when he saw me taking the photo. Regarding the incident later in the day at 13.10 – the incident shown in the video – the two men both claimed that no threats were made. In the video one of them can be plainly heard saying, “Come here I am going to break your face!” Also, that man can be seen getting out of his car and picking up a small rock to threaten me. By way of explanation in court, he said he had dropped his phone and stooped to pick it up. The other man apparently witnessed exactly the same dropping of a phone, although no phone can be seen being dropped or picked up in the video. What woeful lies these were, easily contradicted by the video! Talking about the video, the man who made the threats whined to the judge that I had put the video all over the Internet and had no right to do so. The judge totally ignored his complaint. At the end of the hearing, the curious thing was that there was no verdict! The judge now assesses all the evidence and comes to a conclusion, then informs the complainant and the alleged offender by post. What a very curious system. Thanks to many in Finestrat for your support, and when it comes to election time, remember that the Mayor Juan Fran Llorca tried to get me to quietly drop this case in November. He is a hunter. My days of supporting the Partido Popular are over, as with many thousands of other people in Valencia after the latest corruption and money laundering scandals that go right to the top. It would be a very ugly thing if influence was used to protect a person who has been involved in threatening behaviour and had been easily identified. “The Policia Local were unable to identify who was the man who threatened you with the rock in the morning.” That is not true. Matilde in Finestrat: helping the Museo de Finestrat demonstrate its exhibits. My donkeys are very skilled at dealing with the increasing population of village idiots – and meanwhile try to take their place celebrating the history and traditions of the village. Glad you are in one piece, our hunters not quite as odious as your brand but we really feel for you. Thank you for your support. It is much appreciated! I came home from all this stuff to Morris with an eye problem, so I have been bathing it with warm water. Nothing serious, thank goodness (I don’t need any more stress!) I bet your donks are colder than mine at the moment. What’s the temperature there, high up in central Italy? I’m glad that went in the right direction in Court. Hugs to the donkeys! Possibly, by the time you get here the verdict will have been delivered. Whatever happens, this has implications for the security of the donkeys. 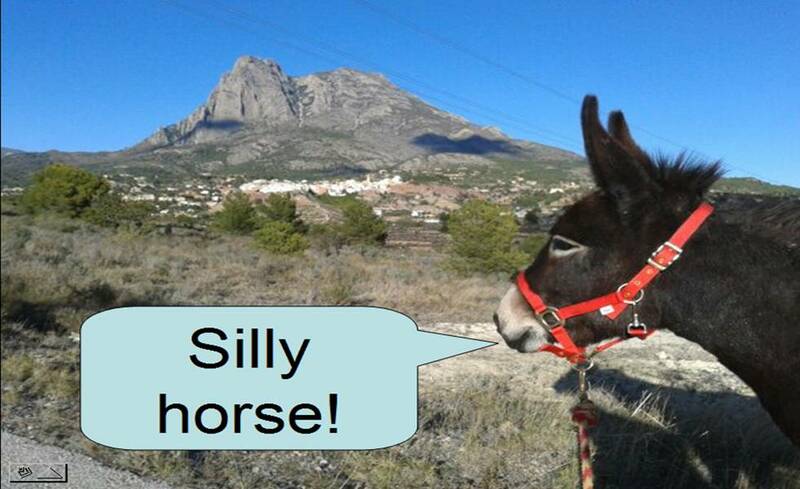 Most people in the village are saying that these embarrassing people (including the Secretary of the Finestrat Hunters’ Association himself, who was in court on a charge) would be very stupid to come anywhere near my house or my donkey field again. However, it is clear that one individual involved in this case has already been protected by the local mafia and was “not identifiable by the local police”. This does NOT encourage any trust in the ability of the local police – or the (hunter) Mayor of Finestrat – to prevent any future menaces. When you are here next month to look after my donkeys, you will have a list of phone numbers to call in an emergency, several local friends within a few minutes drive or walk, and there are now security lights on the donkey field which stay on all night.